July 8th. 62 degrees and steady rain. It’s been like this, off and on, for over a week now and it’s expected to continue through the weekend. Tomato plants, I am sorry. Basil, I am sorry. Peppers, I am sorry. I’ve got a case of Seasonal Affective Disorder and I don’t think it’s the gray weather so much as the sight of my drowning, cold garden. 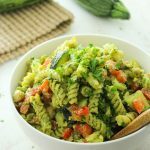 I’m reminiscing about June’s sunny days with this pesto pasta salad which was made with my first cutting of basil and the first zucchinis I’ve ever grown! It’s going to be a while before I have anymore because plants actually need sun to grow, but weren’t they so pretty?! Alright – enough bitching. Let’s talk about pesto. And pasta. They are my sunshine when days are gray. 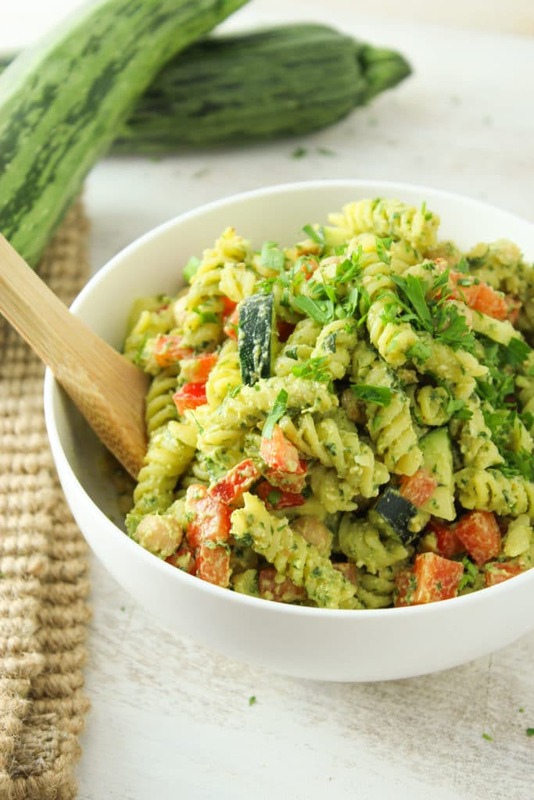 Especially when it’s cute, curly pasta that conveniently coats itself in loads of tangy pesto. Not penne, not macaroni, not orzo – fusilli. Those curvy ridges are the perfect vehicles for my favorite pesto. This recipe is a winner because it’s so easy to make. Just boil pasta, make the pesto while you wait, and mix all the ingredients in one big bowl. 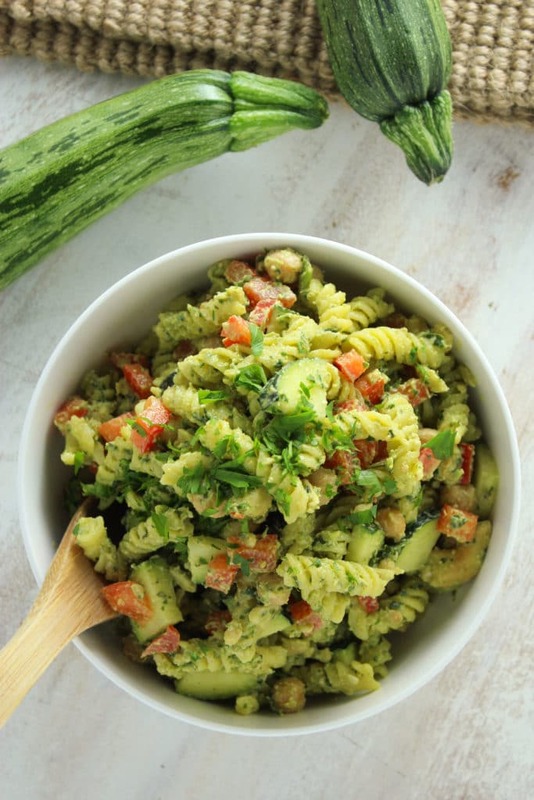 Presto, pesto, pasta salad! I realize I missed the whole Fourth-of-July-bring-a-dish-grillout frenzy, for which this recipe would’ve been quite appropriate. But I’m never on time and besides, I figure there’s plenty of summer left. I, for one, am looking forward to some sunny picnics in the near future. 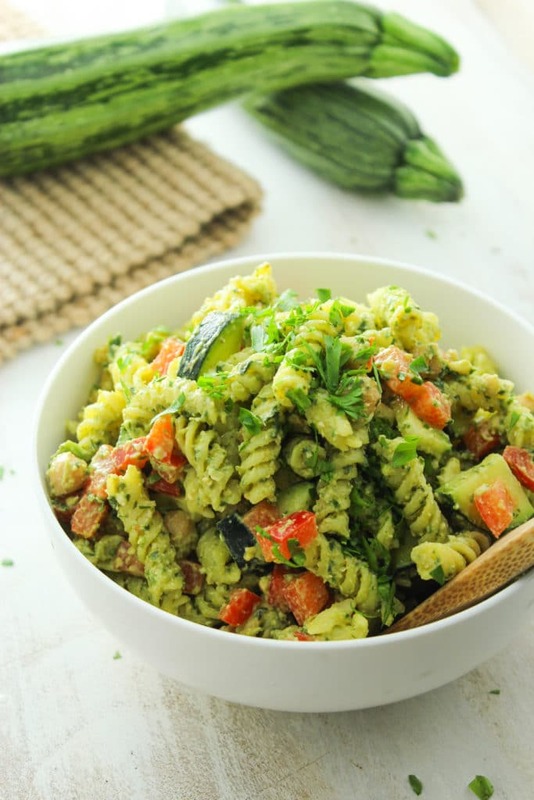 A light and simple summer pasta salad with tangy, fresh pesto and garden vegetables. Boil pasta, drain, and place in a large bowl to cool. Mix with 1 tablespoons of olive oil to keep the pasta from sticking together. 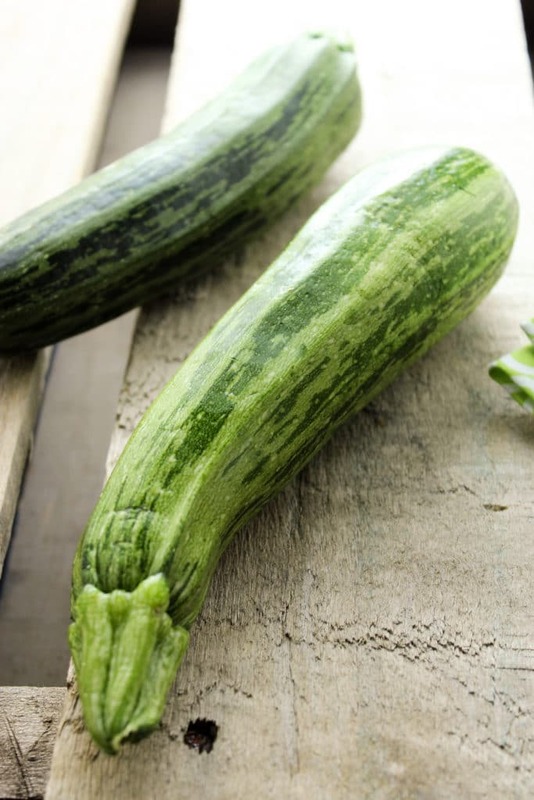 Once it reaches room temperature, add zucchini, red pepper, chickpeas, and seasonings. Mix to combine. Add pesto (instructions below) and mix again to combine. In a food processor, add garlic cloves, 2 tablespoons of olive oil, salt, pepper, and cashews. Process until smooth. Add basil, remaining 2 tablespoons of olive oil, and avocado and process again. If needed, add more olive oil to reach a smooth consistency. Finally, add lemon juice and process until combined. Set the pesto aside until you’re ready to combine with the salad.